To create a stress free move for buyers and sellers. To help clients make the right move instead of “a move.” I also believe that my clients are more than just my clients, they are my friends. Combining technology with personalized service, experience, strong listening skills, communication skills, integrity, and good negotiation skills. Educated and experienced in helping seniors transition from single family homes to townhomes & senior living facilities. Grew up in Crosby-Ironton located in Central Minnesota. Attended K-12 schooling in Crosby with an interest in studio arts and art history. From 1975-1980 attended the University of MN., Duluth and the University of MN., Minneapolis. Majored in Art History and Studio Arts. Currently live in Washington County on 7 acres on a small lake. Other areas Cindy has lived since moving to the Mpls./St.Paul area include, “Old White Bear” in White Bear Lake for 11 years and the St. Paul and Falcon Heights areas for 8 years. Immediate family includes my husband Marty of 29 years who is also a real estate agent, 3 brothers, 1 sister, 13 nieces and nephews and 9 grand nieces and nephews. Current interests include; travel, gardening, golf, boating, art, photography and cooking. In her free time Cindy is enjoying activities with friends or family! Homes on acreage, hobby farms, Lake Property, vintage homes and new construction. 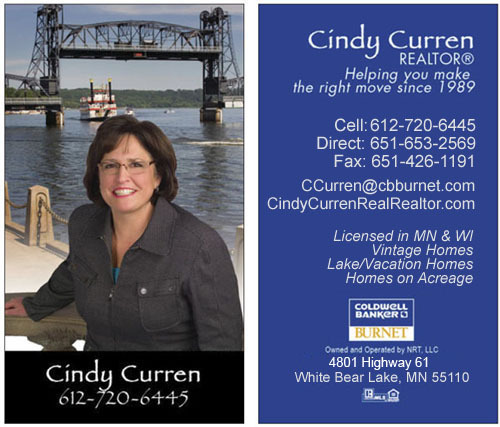 Cindy also works the Brainerd Lakes area where she grew up and is knowledgeable about the many lakes and the region. Northern and Eastern suburbs including, White Bear Lake, Stillwater, Grant, Afton, Forest Lake, Scandia, North Branch, Cambridge, Lino Lakes, Shoreview and Arden Hills. Since moving to the Twin Cities, Cindy has lived in the North Eastern suburbs and is very familiar with the schools, neighborhoods and businesses of these communities whether you live in town or in the country. Short Sales and Foreclosures. Extensive education in the foreclosure & short sale process. Removing the stress for sellers & buyers while navigating through the complicated sale or purchase of bank owned and short sale properties. Licensed in Minnesota since 1989 and Wisconsin since 2004. 1989-1993- worked out of the Stillwater office of Merrill Lynch Realty which was then purchased by Ralph Burnet and Dar Reedy and the name changed to Burnet Realty along with most other Merrill Lynch offices. 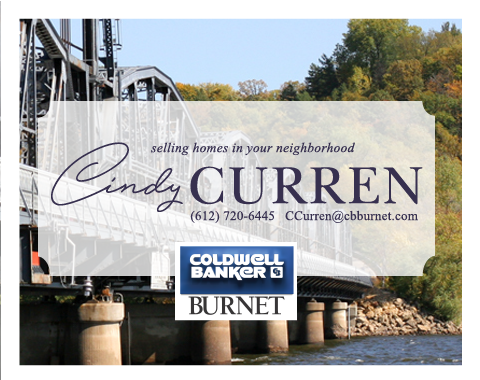 1994-present- currently working out of the White Bear Lake Coldwell Banker Burnet office. In 1998 Ralph Burnet and Dar Reedy sold Burnet Realty to Coldwell Banker and most Burnet offices were renamed Coldwell Banker Burnet. Throughout the last 28 years there have been corporate buy-outs and name changes to our company but most of the local management and support staff has stayed intact through these transitions. Because of the support provided by Coldwell Banker Nationally as well as locally Cindy feels this is the best company to work with for herself and her clients. We at Coldwell Banker Burnet are extremely progressive in networking,technology and attracting the highest caliber of real estate professionals. Cindy Curren is a Certified Relocation Specialist and holds a Graduate of Realtor Institute (G.R.I.) designation. She is also a member of Coldwell Banker’s International Presidents Elite club which is the top 10% of Coldwell Banker agents internationally. Cindy was also designated a “Super Agent” by Minneapolis/St. Paul magazine in 2007, 2008, 2009 and 2010. Thinking of selling or buying a home but don’t know where to start? What can I do to my home to make it sell faster and for more money? What kind of service do I expect from my agent and broker? Has your home been on the market with a Real Estate Broker and didn’t sell? Discouraged with trying to sell your home on your own? Can’t find a home that reflects your needs in your price range? Have you had the experience of not connecting with your real estate agent? The home buying process has been frustrating because you and your agent don’t see “eye to eye”. In today’s world of voice messaging, emails, texting, cell phones, pagers, social media and the internet, is there a need for service in person? Selling homes is still a people to people, face to face, eye to eye business. If your home is not sold, maybe you aren’t working with the right network. I welcome the opportunity to meet with you in person to discuss how I integrate technology’s resources with a “human” approach to selling homes.